The wristrest is incised in low relief with a spotted deer gazing at blades of grass issuing from a rockwork formation, all beneath a pine tree. 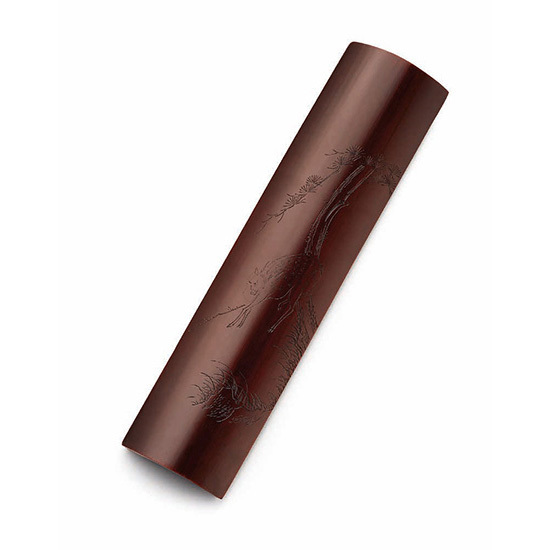 The bamboo is dark in colour and richly patinated to a lustrous reddish-brown colour. The evergreen pine is associated to longevity and its resilience to the implacable winter also makes it a symbol of noble endurance in the face of adversity. The deer (lu 鹿), on the other hand, is a pun and symbolises the God of Prosperity. It also alludes to longevity, as it is traditionally believed to be the only animal capable of finding the lingzhi fungus of immortality and is often depicted as the companion of Shoulao (the God of Longevity).